Extensive renovations have been made to the Emerson Colonial Theatre, which will open June 27. When the curtain rises this month at the Emerson Colonial Theatre, “Moulin Rouge! The Musical” will be center stage, but the real star will be the long-shuttered hall itself, which after months of painstaking renovations will reclaim its place as a crown jewel of Boston theater. The opening marks an auspicious new era for the Colonial, which for decades was one of the country’s preeminent venues for pre-Broadway tryouts, but whose future was thrown into doubt when Emerson College closed the theater in 2015. 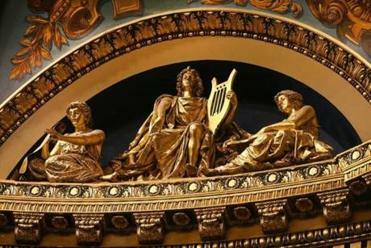 The Colonial’s new operator, the UK-based Ambassador Theatre Group, now plans to extend these twin legacies, restoring the gilded hall to its former grandeur while presenting touring shows and original productions bound for Broadway. 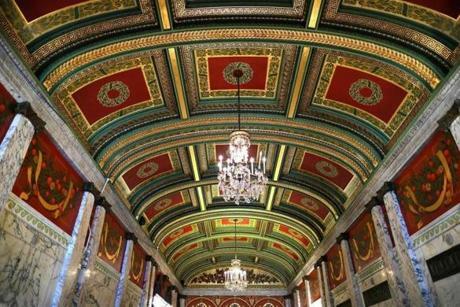 To that end, crews have spent more than 37,000 man-hours repairing murals, re-creating plaster molds, retouching gold leaf, lofting a new marquee, and installing some 42,000 square feet of carpet — a bespoke weave of patterns from around the time the Colonial opened in 1900. 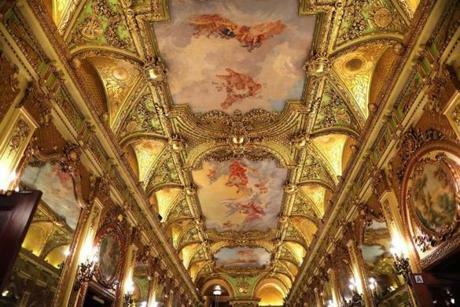 Fresh gilding adorns the theater’s central lobby. So it is that the Colonial reborn is an amalgam of the old and new: The central lobby — evocative of the Versailles Hall of Mirrors — shimmers with fresh gilding, a custom bar, and original mirrors, as retouched putti gambol above. The fabled ladies’ room lounge — where Bob Fosse once tap-danced atop the onyx table — features a second new bar, restored plaster work throughout, and the original table Fosse once chipped. New orchestra-level seats in the auditorium are wood-backed and roomier, while refurbished seats in the mezzanine and balcony promise more comfort and legroom in the theater’s notoriously cramped upper levels. The reimagined Colonial seats 1,624, including 16 spots for wheelchairs, two of which are by the stage. But perhaps the most apparent change to the auditorium — which for decades was painted crimson with a salmon-colored design — is the fresh coat of cerulean blue with a hand-stenciled overlay. The Ambassador group declined to disclose the renovation project’s budget. The company, one of the world’s largest producers and presenters of live theater, has been making deep inroads into the North American market in recent years, assuming control of theaters in New York, Texas, and Louisiana. It also operates two Broadway venues: the Hudson Theatre and the Lyric Theatre. With its 40-year lease of the Colonial, the company now has a prized perch in New England from which to showcase and develop its productions. Even so, ATG enters a crowded Boston market, where the Colonial must compete with other downtown Broadway-style venues such as the Boston Opera House, the Boch Center’s Wang and Shubert theaters, the Cutler Majestic, and the Paramount Center. Kristin Caskey, ATG’s executive vice president of content and creative, North America, said the company was undeterred by the city’s abundance of such theaters. 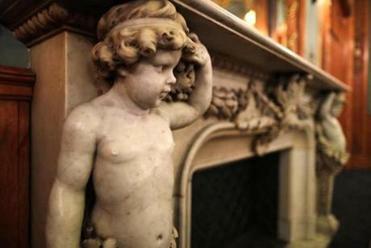 A refurbished fireplace adorns one room in the theater. As part of the renovation, ATG has converted one of the Colonial’s lower chambers into an “Ambassador Lounge,” a feature ATG offers at each of its theaters. Those willing to pay a $50 ticket upgrade will receive expedited seating, a complimentary drink, lounge seating for limited food service, and, critically, a dedicated bathroom for the lounge’s 25 or so guests. ATG has also upgraded the bathrooms throughout the theater, though (sorry, ladies) other than the transformation of a men’s restroom into a gender-neutral facility (with changing table), there are no new women’s restrooms. 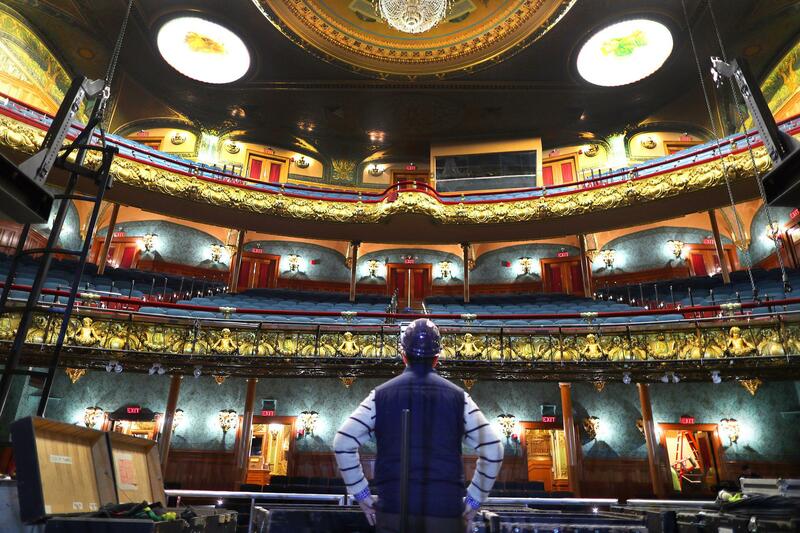 The ATG renovation marks the third time the Colonial has undergone extensive restoration. It was updated once in the late 1950s and again in the mid-1990s. And while ATG has gone to great lengths to preserve the historical nature of the theater’s public spaces, it has utterly transformed the backstage area, converting a warren of rooms into a suite of dressing rooms, bathrooms, and other flexible spaces for cast and crew. Figures high above the side of the stage. Emerson College, which has owned the Colonial since 2006, replaced the building’s HVAC system and made other improvements before ATG took over the renovations. The building now has a new security office, electrical room, Wi-Fi networks, and sound and light systems. But perhaps the biggest backstage upgrade is a new fly system to lower scrims and backdrops onto the stage. ATG has replaced the original wood grid at the top of the fly tower with a new steel grid, replacing the old system of ropes and sandbags with a modern counterweight system. The improvements mark a dramatic turnaround for the Colonial, whose existence as a theater seemed threatened in the fall of 2015, when it was revealed Emerson was considering a plan to turn the building into a flexible college dining hall/performance space. Emerson abandoned the plan after months of public outcry, striking the ATG deal in early 2017. Starting June 27 with “Moulin Rouge!,” a world premiere based on the Baz Luhrmann film, ATG plans to present a mix of new works and touring shows. The musical will be followed immediately by what Schwartz called an “opening nights festival” — a series of one-night performances that may include comedy acts, concerts, children’s shows, and speakers. Broadway in Boston, which usually presents shows at the Opera House, plans to present three shows at the Colonial next season, starting with the British comedy “The Play That Goes Wrong” in November. ATG vice president Caskey emphasized the company was committed to reviving the tradition of Boston as a tryout town. A view of the entrance lobby to the theater.